The City of Baltimore has plans, big plans, digital transformation plans. That’s why they reached out to MOXIE Promotion’s Laura Gaworecki to work her Waterfront Tech Series magic. 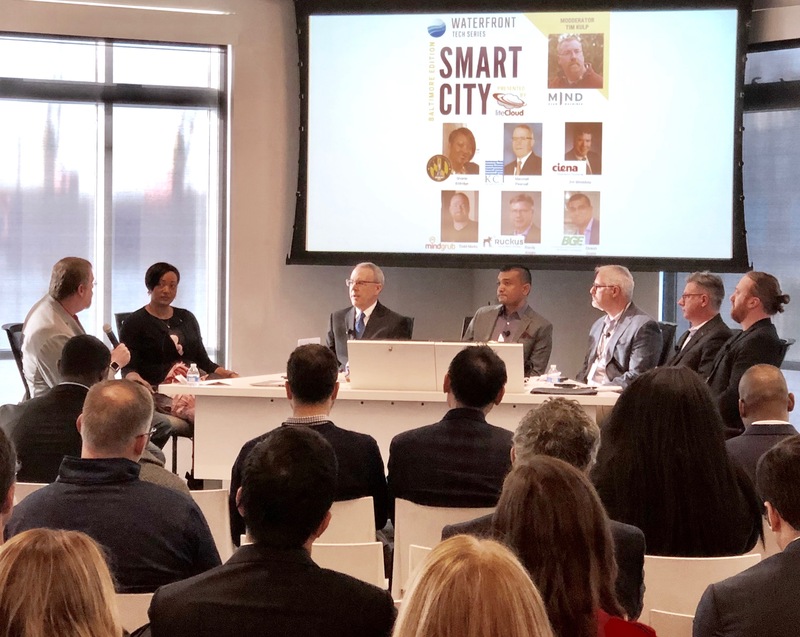 Laura’s vision for Episode 7: Smart City was a panel discussion to educate people about smart cities and build awareness of Baltimore’s progress toward becoming one. She asked our VP of Innovation and Strategy Tim Kulp to moderate the panel. Technical.ly’s Stephen Babcock put together a great synopsis of the event. So we figured we’d provide a behind-the-scenes look at the making of a smart city panel that served people, not tech companies. When Tim and the panelists got together ahead of time to shape the conversation, they knew they wanted to avoid the usual tech talk and sales pitches. “Every panelist expressed the same concern: ‘I don’t want this to be like every other smart cities panel because they’re all self-serving pap,’” Tim remembers. Each panelist brought their unique expertise to the table and left the sales pitches at home. Deputy Chief of Operations Shonte Eldridge explained Baltimore’s smart city strategy and work to involve the community in it. Divesh Gupta (BGE) brought a forward-thinking energy and utilities perspective. Randy Knight (Ruckus Networks) had coverage and connectivity know-how plus a lifetime of understanding and meeting people’s needs. Dave Krauss (Ciena) ensured cybersecurity concerns were front and center. Teacher-turned-technologist Todd Marks (Mindgrub) focused on how smart-city tech can help people prepare for and access job opportunities. It wasn’t just a collection of specialists. It was a collection of lives lived, lessons learned and the convictions that come out of that. Wireless advocate Marshall Pearsall (KCI) wryly observed that he’d spent most of his early career building the Digital Divide, so he planned to spend the rest of his career closing it. The panel roundly agreed that should be the true goal of smart cities – providing access to online services and tools, bridging digital divides. If you have interest, aptitude and passion for smart city development, the City of Baltimore is accepting applications to serve on its Smart City Committee. You can apply online. Like any tech project, smart city development has to start with asking people – in this case, the entire community – what they need. Listen to their answers, and then get to work providing for those needs. Waterfront Tech Series set up a survey to do exactly that. You can still participate in the survey here. The top two demands have been Wi-Fi and public transportation improvements. The panel made a point of taking on the question: Once you provide the tools and/or services requested, do you need to tell people how they should use them? For the answer, they drew from Randy’s earlier life as a counselor during the AIDS epidemic. He routinely saw how people, provided with the necessary resources, figure out how to use them in ways that improve their lives. In other words, give people the tools and get out of their way. Tim thoroughly enjoyed the opportunity to move beyond panelists’ titles and affiliations and draw out their stories, wisdom and motivations. As city officials know, the more community input we can garner, the smarter Baltimore will be. Mind Over Machines thanks the panelists, Laura Gaworecki and Brown Advisory for a truly people-focused smart city panel. Smart cities run on ubiquitous connectivity. Citywide Wi-Fi enables all kinds of IoT devices and services. Streetlights that help you find a parking space and trash cans that notify public works when they need to be emptied are cool things to have. But the real value of a smart city is when a smartphone becomes the only device a resident needs to access a job board, submit an application, and navigate public transportation to the interview so they can finally land that dream job. Digital transformation enabling personal transformation? Now that’s a Smart City.